Every day I have the privilege of interacting with the senior leadership teams of some of the largest and most successful companies in the world. 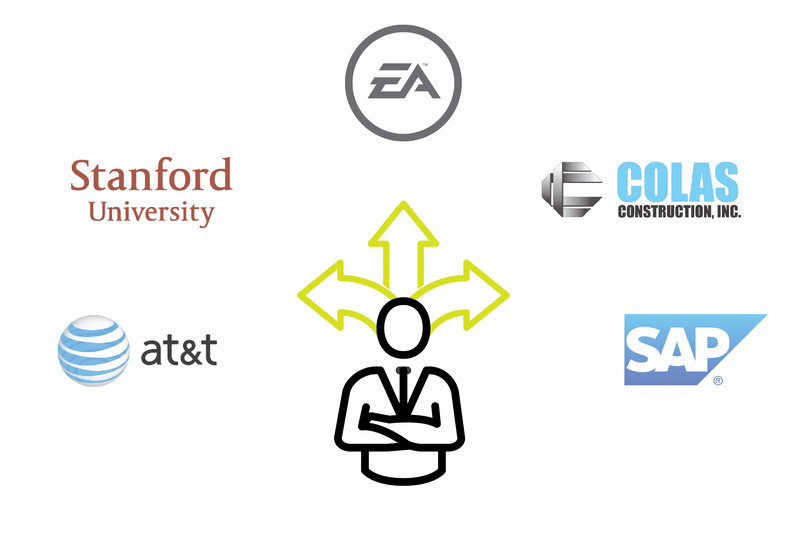 Companies like AT&T, Stanford University, Electronic Arts, The Colas Companies, SAP and many others trust Leadership Landing to awaken great leadership in their organizations. The best part of my role as an executive coach is developing deeply personal relationships with my clients and understanding what makes these exceptional people tick. I see it all: their strengths and weaknesses, insights and blind spots, drives and discouragements. I see the forces that propel them forward but also what holds them back. One senior executive—a powerhouse in her organization—had one foot out the door when I met her. A year into our coaching, she was offered a magnificent promotion, and she was ecstatic. The executive’s transition was possible because of the focused, personal work she was willing to do to deepen her relationship with herself and thereby achieve the quiet and peacefulness required to instill confidence in others and lead her organization. Through all my years observing and assessing, I’ve identified a set of common characteristics all great leaders share. I call them The Five Attributes of Great Leaders, and they are: self-awareness, bravery, kindness, innovation, and inspiration. “A clear sense of identity.” They know who they are. They take action, make decisions, and pursue strategies in accordance with a strong set of personal values. “A clear sense of purpose.” They know what they want. They set goals, envision outcomes, and build organizations that align with their personal and professional values. “A distinct, consistent way of interacting with others.” When leaders are authentic and genuine with themselves, they can be the same with others. When personal interactions are in line with a core set of values, their interpersonal behavior is steady and reliable; their communication direct and concise. They quickly build trust, and earn respect. Self-awareness is the starting point because it allows room for all the other attributes to grow. Bravery requires self-confidence and kindness requires self-acceptance. Innovation and inspiration spring forth from self-assurance. Self-awareness guides the other attributes toward a unified and appropriate vision. Brave decisions that take the company off course are harmful. Innovation without productivity is a waste. Self-awareness is the compass that ensures the other attributes are moving in the right direction. It is at the heart of leadership, and without it, we are lost. When I think about all the obstacles that hold my clients back, lack of self-awareness is the one characteristic I see most often. Nothing brings me greater satisfaction than knowing that Leadership Landing’s private coaching, and more contemplative approaches, have a positive impact on our client’s professional careers. Leaders who love their job create an environment that is both energizing and engaging—key motivators for employees to perform well. Great leaders know that the true value of any coaching is driven by the personal desire to self-improve, to become a better version of yourself.